Fans of The Wooden Table will have noticed that we love uni. We L-O-V-E uni. But really, what’s not to love? The taste of the deep sea, the clean, sweet, buttery urchin goodness has a firm grip on our appetites. The best uni comes from the roe that’s harvested from the red sea urchin. They are typically found in 30-90ft waters near kelp forests, their primary source of food. Uni is most often hand harvested by divers, couple that with a low per urchin yield and it becomes easy to understand the higher price point. Most people probably first encountered uni wrapped in nori and served atop sushi rice (as we did). Makes sense, as the Japanese are widely considered the arbiters of cool for all things raw and seafood (although sea urchin is also regularly consumed in the Mediterranean). Its odd appearance (little orange tongues? Who’s tasting who?) 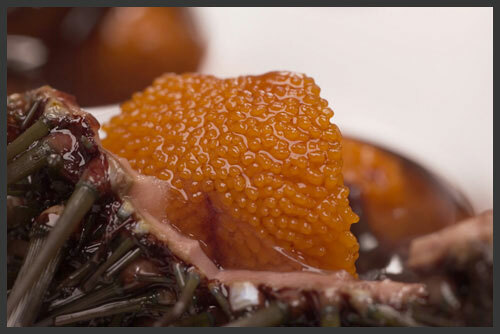 seemed to relegate sea urchin roe to the category of “exotic delicacy”. But it soon found itself both elevated to the Michelin level (Eric Ripert makes an uni custard at Le Bernadin) and it has also gained so much street cred that uni has appeared as a luxurious pizza topping at Neopolitan-inspired San Francisco pizzaria, Cotogna (ok so Michael Tusk of Cotogna does have a Michelin star with Quince but still . . . it’s pizza). At The Wooden Table we like to start the meal with an uni vinaigrette over cold soba (it’s been on every one of our menus). To add a little bit more geek chic to this post, a friend of The Wooden Table recently turned us on to the memoirs of a California sea urchin diver. Some might not know that California (Santa Barbara to be exact) is known by many uni connoisseurs as home to some of the best uni in the world (most of which is exported to Japan). 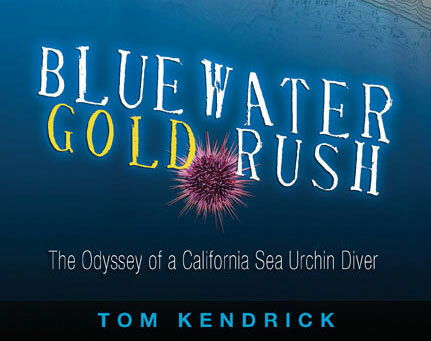 Because we just can’t resist consuming anything that has uni in it ‘Bluewater Gold Rush’ has jumped to the top of our reading list.